The Compact Pocket Otoscope with Fiber Optic (F.O.) 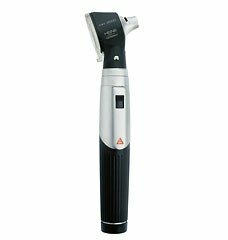 IlluminationModern pocket otoscope in a unique, compact design. Handy and powerful.Can only be used with the mini 3000 handle system.Instrument head matt-black inside- Eliminates reflexes.Distal Fiber-Optic (F.O.) illumination with enhanced XHL Xenon Halogen Technology producing 100% more light compared with conventional bulbs- Homogenous, reflex-free illumination of ear canal and tympanum.2-piece handle and head- Easy to maintain, flexible.Compatible with other mini 3000 instrument heads.Insufflation port- For pneumatic testing of tympanic mobility. Please order connector separately.Viewing window with 3x magnification and optimized casing surface for razor-sharp images and minimal reflection. Swivelling viewing window built into instrument.High-quality handle: Chrome-finish upper section/refined plastic. Shockproof, sturdy, non-slip.Attachment clip with integrated on/off switch. Secure. Switches off automatically when returned to the pocket. 20.000 switch cycles guaranteed.WITH 5 OF BOTH 2.5MM AND 4MM DISPOSABLE TIPS .